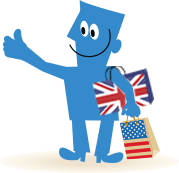 Borderlinx | Buy Mini-la-mode and ship worldwide with Borderlinx. Cheap rates guaranteed. Mini-la-mode's baby clothes are made from the highest grade of hand-picked Peruvian pima cotton available, which is 100% certified for its premium quality. True Pima cotton is an unrivalled soft and silky fabric, and is therefore perfect for precious new born skin. It also allows skin to breathe naturally which is essential for regulating a baby's body temperature. All of Mini-la-mode's items are lovingly hand made by traditional artisans, detailed with smocking and embroideries immaculately hand stitched. The nursery and bedding range is made from the softest Indian cotton voile, hand block and screen printed in the brand's workshops in India - a country where the founder, Fee, and her family have lived and worked, and retain a huge passion for its people and traditions. These traditional hand skills combined with modern manufacture processes are unique and make the collections what they are. Mini-la-mode's designs as modern day heirlooms to pass down - beautiful things that will last through generations and the test of time. Now you too can buy Mini-la-mode in the UK for cheap and have it shipped right to you with Borderlinx. To help you with complicated shipping, tax & duties, you can try our Shipping cost calculator. A number of services are available through Borderlinx to make international ordering from Mini-la-mode UK hassle-free, including concierge, free repacking and consolidation services.